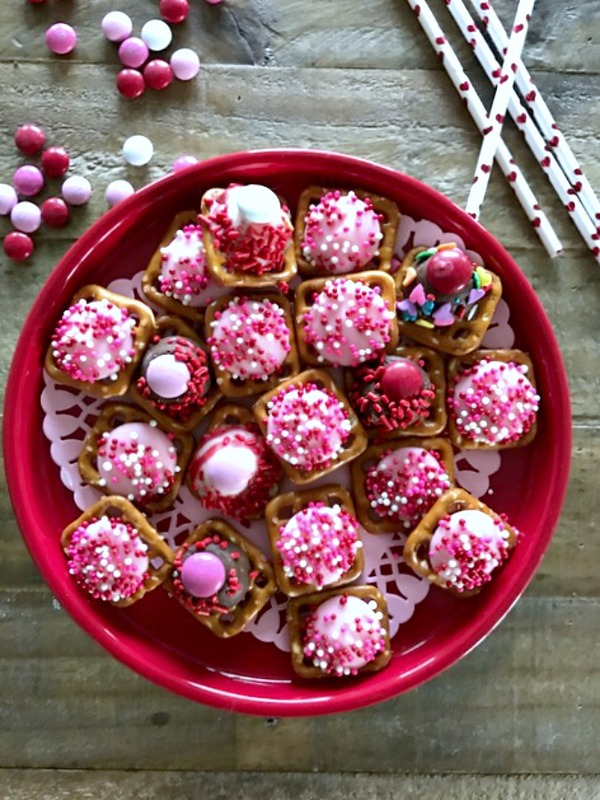 Sweet and Salty Chocolate Valentine Pretzel Snaps – These cute little snaps have just the right balance of sweet and salty deliciousness. 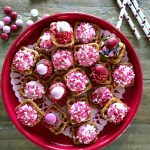 Takes only a few minutes to make these and everyone will love them. Enjoy! It’s that time of year again. Valentines Day! I usually call it “Chocolate Day” Well, this little treat is no different. 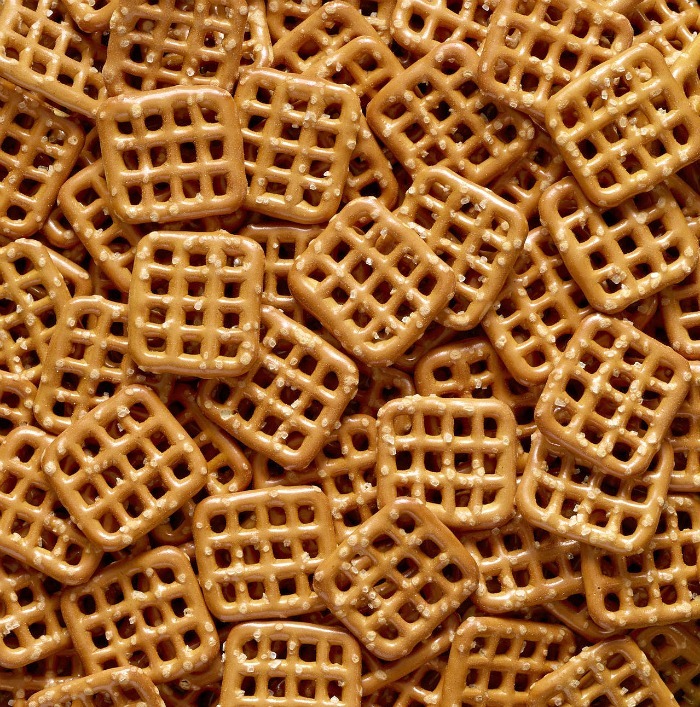 It’s got the sweet and salty too. 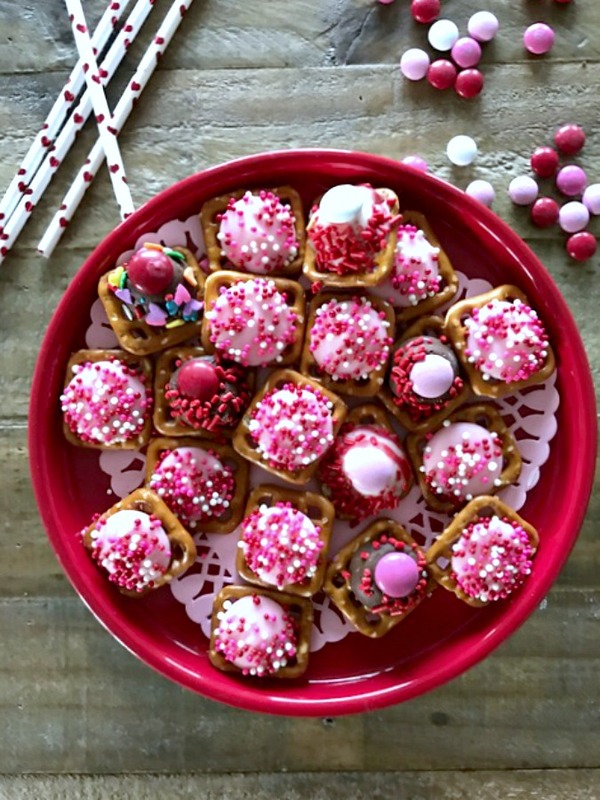 With only 3 ingredients you have a fun and cute treat for the ones you love. Great for gift giving to teachers. The kids can easily help make these and be proud to hand them out. Preheat oven to 375 degrees. Line two cookie sheets with parchment paper, set aside for just a few minutes. While the oven is heating up. Unwrap the Kisses and Hugs chocolates. Lay out the amount of Candy Melts you plan on using. Get your sprinkles opened up with a teaspoon ready. Take out of the oven and carefully place cookie sheets on cooling rack on counter. Now, press M&M and sprinkles over each chocolate snap. Let sit on counter to cool completely. Place in fridge for 15 minutes to completely firm up. Place in an air tight container or zip lock bag. They will stay for up to 4 days on the counter (If they last that long). These cute little snaps have just the right balance of sweet and salty deliciousness. Takes only a few minutes to make these and everyone will love them. Enjoy! 1.Preheat oven to 375 degrees. Line two cookie sheets with parchment paper, set aside for just a few minutes. 2.While the oven is heating up. Unwrap the Kisses and Hugs chocolates. Lay out the amount of Candy Melts you plan on using. 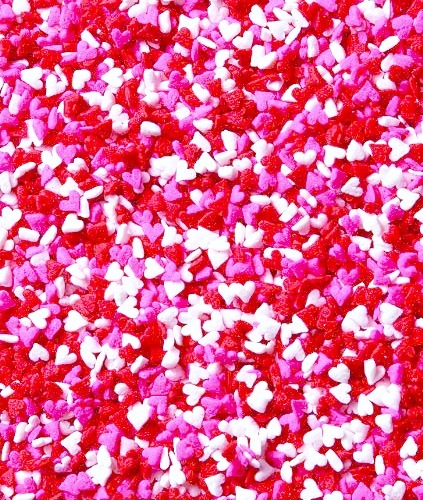 Get your sprinkles opened up with a teaspoon ready. 4.Take out of the oven and carefully place cookie sheets on cooling rack on counter. Now, press M&M and sprinkles over each chocolate snap. Let sit on counter to cool completely. Place in fridge for 15 minutes to completely firm up. 5.Place in an air tight container or zip lock bag. They will stay for up to 4 days on the counter (If they last that long). Enjoy!